Jon Stuefloten Restoration Painting offers a wide range of painting and restoration services. He prides himself in the quality of his workmanship and is known and respected for his accomplishments on projects of historical significance. Below are features that showcase his work and tell stories about his projects from local publications including The Carmel Magazine, The Carmel Pinecone, The Monterey Herald and the Carmel Mission Bulletin. At age 78, restoration Specialists John Stuefloten is busier than ever: The lifelong Carmel resident has completed projects as varied as working on the kitchen at Crespi Hall at the 247 year old Mission San Carlos Borromeo de Carmelo, protecting the wine Caves at Holman Ranch Winery, and repainting The Point Sur Lighthouse. Stuefloten and his loyal crew will do whatever it takes to ensure that projects are completed correctly. 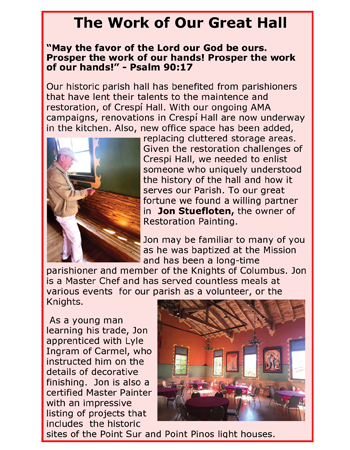 Our historic parish hall has benefited from parishioners that have lent their talents to the maintence and restoration, of Crespi Hall. With our ongoing AMA campaigns, renovations in Crespi Hall are now underway in the kitchen. Also, new office space has been added, replacing cluttered storage areas. Given the restoration challenges of Crespi Hall, we needed to enlist someone who uniquely understood the history of the hall and how it serves our Parish. To our great fortune we found a willing partner in Jon Stuefloten, the owner of Restoration Painting. Jon may be familiar to many of you as he was baptized at the Mission and has been a long-time parishioner and member of the Knights of Columbus. Jon is a Master Chef and has served countless meals at various events for our parish as a volunteer, or the Knights. As a young man learning his trade, Jon apprenticed with Lyle Ingram of Carmel, who instructed him on the details of decorative finishing. Jon is also a certified Master Painter with an impressive listing of projects that includes the historic sites of the Point Sur and Point Pinos light houses. MILK PAINT. It’s been used for thousands of years, and you can make it at home if you like. Other than a slightly sour odor that craft queen Martha Stewart swears will go away when it dries, it’s odorless. It’s also non-toxic and has been known to last more than a hundred years. 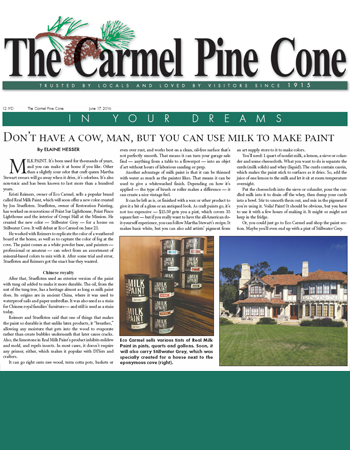 Kristi Reimers, owner of Eco Carmel, sells a popular brand called Real Milk Paint, which will soon offer a new color created by Jon Stuefloten. Stuefloten, owner of Restoration Painting, has worked on renovations of Point Sur Lighthouse, Point Pinos Lighthouse and the interior of Crespi Hall at the Mission. He created the new color — Stillwater Grey — for a house on Stillwater Cove. It will debut at Eco Carmel on June 23. He worked with Reimers to replicate the color of a weathered board at the home, as well as to capture the color of fog at the cove. The paint comes as a white powder base, and painters — professional or amateur — can select from an assortment of mineral-based colors to mix with it. After some trial and error, Stuefloten and Reimers got the exact hue they wanted. Chinese royalty After that, Stuefloten used an exterior version of the paint with tung oil added to make it more durable. The oil, from the nut of the tung tree, has a heritage almost as long as milk paint does. Its origins are in ancient China, where it was used to waterproof sails and paper umbrellas. It was also used as a stain for Chinese royal families’ furniture — and still is used as a stain today. Reimers and Stuefloten said that one of things that makes the paint so durable is that unlike latex products, it “breathes,” allowing any moisture that gets into the wood to evaporate rather than create bubbles underneath that later cause cracks. Also, the limestone in Real Milk Paint’s product inhibits mildew and mold, and repels insects. In most cases, it doesn’t require any primer, either, which makes it popular with DIYers and crafters. It can go right onto raw wood, terra cotta pots, baskets or even over rust, and works best on a clean, oil-free surface that’s not perfectly smooth. That means it can turn your garage sale find — anything from a table to a flowerpot — into an objet d’art without hours of laborious sanding or prep. Another advantage of milk paint is that it can be thinned with water as much as the painter likes. That means it can be used to give a whitewashed finish. Depending on how it’s applied — the type of brush or roller makes a difference — it can create a nice vintage feel. It can be left as is, or finished with a wax or other product to give it a bit of a gloss or an antiqued look. As craft paints go, it’s not too expensive — $15.50 gets you a pint, which covers 35 square feet — but if you really want to have the all-American doit-yourself experience, you can follow Martha Stewart’s recipe. It makes basic white, but you can also add artists’ pigment from an art supply store to it to make colors. You’ll need: 1 quart of nonfat milk, a lemon, a sieve or colander and some cheesecloth. What you want to do is separate the curds (milk solids) and whey (liquid). The curds contain casein, which makes the paint stick to surfaces as it dries. So, add the juice of one lemon to the milk and let it sit at room temperature overnight. Put the cheesecloth into the sieve or colander, pour the curdled milk into it to drain off the whey, then dump your curds into a bowl. Stir to smooth them out, and mix in the pigment if you’re using it. Voila! Paint! It should be obvious, but you have to use it with a few hours of making it. It might or might not keep in the fridge. Or, you could just go to Eco Carmel and shop the paint section. Maybe you’ll even end up with a pint of Stillwater Grey. Jon Stuefloten's earliest introduction to design came from his father, who helped Hugh Comstock build Carmel's trademark cottages. "They were very meticulous about their work and accuracy. Their work was top-notch, and that's the attitude I have always carried," says Stuefloten. As a painter specializing in historic restoration, Stuefloten has put his stamp on several high-profile local projects. 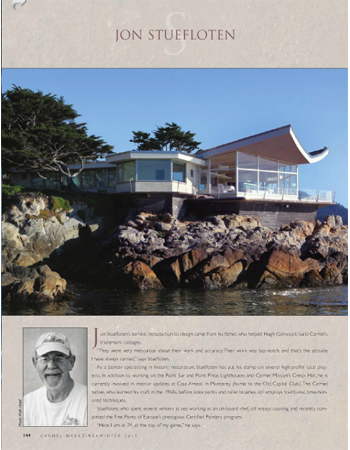 In addition to working on the Point Sur and Point Pinos Lighthouses and Carmel Mission's Crespi Hall, he is currently involved in interior updates at Casa Amesti in Monterey (home to the Old Capital Club). The Carmel native, who learned his craft in the 1950s, before latex paints and roller brushes, still employs traditional, time-honored techniques. Stuefloten, who spent several winters at sea working as an on-board chef, still enjoys cooking and recently completed the Fine Paints of Europe's prestigious Certified Painters program. "Here I am at 74, at the top of my game," he says. As a young boy, Jon Stuefloten lived in the Carmel Highlands and attended Bay School. When he was in fourth grade, his family moved to Carmel to be closer to his father’s work — helping to build Comstock houses. As soon as Stuefloten was old enough, he started working with his father. In time, he apprenticed with a painter. “This was before there were latex paints and rollers. When the first rollers came out, we thought they were the devil’s tool,” he laughed. His first job as an apprentice was to make buckets of primer every morning. He mixed paint thinner with linseed oil and added shavings of bright white lead, which dissolved into the liquid. “It was so bright, it was nearly blinding,” he said. Later, he said, he was honored to apprentice with Lyle Ingram, an expert in faux finishes who worked in Monterey. He taught Stuefloten how to create faux marble, wood grain and other effects. In the early 1970s, Stuefloten worked as a contractor and installed some of the first hot tubs in people’s homes. He said that led to some small building jobs and then, through a mutual friend, he was asked to do some demolition in Carmel Valley. It was part of a project to build homes there for the members of Earth, Wind & Fire. “I did the job, cleaned up, and got everything done on time and within budget. The contractor in charge fired his superintendent at the site and hired me.” He completed the project, including finding an expert to create some stained-glass windows. In 1980, Stuefloten started his own painting business. At the time, faux finishes were becoming trendy with homeowners again, and Stuefloten was already an expert from his work with Ingram. He also worked on a lot of older homes and got a reputation not only for applying finishes, but for being able to match and repair damaged surfaces. Despite the good word of mouth, every year, he’d get a booth at a local home show to promote his business. It was there he met John O’Neil of the Central Coast Lighthouse Keepers. O’Neil told Stuefloten there was lead-based paint that needed to be removed at Point Sur Lighthouse. Stuefloten bid for the job against abatement specialists — people who remove and dispose of lead and other hazardous materials for a living. His extensive research led him to a chemical being sold in Nyack, N.Y. It converted the lead in the paint to lead sulfate, which could be safely and easily removed and disposed of. As a result, Stuefloten’s bid was lower than his competitors’, and he got the job, beginning an enduring relationship with the CCLK. He’s worked on the lighthouse keeper’s home, he’s matched colors so they’re historically correct, and now is preparing to repaint the lighthouse dome. Other memorable jobs for Stuefloten included painting the former Mediterranean Market. He remembered that as they were washing the exterior, they exposed the Carmel Dairy sign, and he decided to restore it to its original glory. He’s also worked on Point Pinos Lighthouse and Crespi Hall at the Mission. The former Hart Mansion, now home to White Hart Tearoom in Pacific Grove, is also a recipient of Stuefloten’s TLC. The colorful 1893 Queen Anne’s exterior was redone with period-appropriate colors that Stuefloten researched before beginning. Current projects include Casa Amesti in Monterey, also known as the home of The Old Capitol Club. He’s already restored two solariums and is waiting for approval from the Department of the Interior to do the exterior of the historic building. Probably one of the smallest jobs he’s ever done is also the one he’s proudest of, though. He said he was honored to be asked to clean and restore the graves and two altars inside the Mission, including applying copper leaf to all the names. At age 74, he doesn’t plan to put the finishing touches on his career anytime soon. He recently became a Certified Painter through Fine Paints of Europe in Vermont. The program requires recommendations from other professionals and completion of a two-day seminar at the company’s headquarters. Although Stuefloten enjoys historic restoration, he also keeps up with what he calls “bread and butter” jobs. He’s loyal to his workers. And they return the favor — the newest among them has been there for 12 years. “My crew is so deserving. I want them to have all the work they can possibly handle, long into the future,” he said. Soon, any house in the world can have a touch of Pebble Beach. That’s because a new paint color said to capture the essence of Stillwater Cove fog is on the way. It all came about through a unique partnership with a company that creates nontoxic paint products. 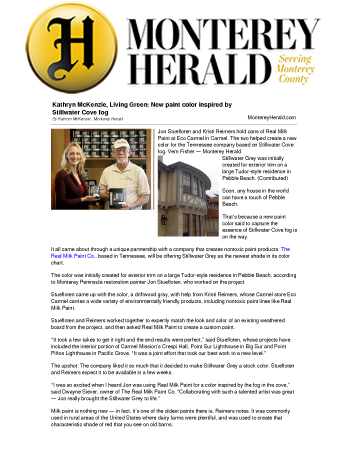 The Real Milk Paint Co., based in Tennessee, will be offering Stillwater Grey as the newest shade in its color chart. The color was initially created for exterior trim on a large Tudor-style residence in Pebble Beach, according to Monterey Peninsula restoration painter Jon Stuefloten, who worked on the project. Stuefloten came up with the color, a driftwood gray, with help from Kristi Reimers, whose Carmel store Eco Carmel carries a wide variety of environmentally friendly products, including nontoxic paint lines like Real Milk Paint. Stuefloten and Reimers worked together to expertly match the look and color of an existing weathered board from the project, and then asked Real Milk Paint to create a custom paint. The upshot: The company liked it so much that it decided to make Stillwater Grey a stock color. Stuefloten and Reimers expect it to be available in a few weeks. Milk paint is nothing new — in fact, it’s one of the oldest paints there is, Reimers notes. It was commonly used in rural areas of the United States where dairy farms were plentiful, and was used to create that characteristic shade of red that you see on old barns. A blend of the milk protein casein, limestone and earth pigments, milk paint “is very durable,” said Reimers. “It doesn’t peel or chip.” Stuefloten confirms that milk paint bonds well for exterior use, and he uses an additive that gives it additional staying power. Also, milk paint has an authentic look to it that designers love, a chalky sort of finish that is perfect for furniture and interiors. It can be thinned to use as a wash, or kept thicker to be more opaque. The other fascinating thing about milk paint is how environmentally friendly it is. Although there are numerous nontoxic and no-VOC paints on the market, milk paint appears to be about as pure as you can get. “It’s so nontoxic that you can actually pour the extra paint onto the ground and it becomes a natural fertilizer,” said Stuefloten. It just goes to show that we shouldn’t forget about the old ways in our modern age. This is one example of how something that might have been forgotten has been revived, not just for our benefit, but for the Earth as well. Do you have questions or tips about sustainable living around the Central Coast? Send them to Kathryn McKenzie at pardonmygarden@att.net.